CHIPPENHAM HALF MARATHON IS A RUNNING SUCCESS! Awdry Bailey & Douglas was proud to be a Main Sponsor for the Chippenham Half Marathon which took place on Sunday 7 September 2014. The weather was warm and sunny with a light breeze. A sea of runners took off from the start line at the Chippenham Sports club making their way around the predominantly flat course. ABD Team took part in the event which was a running success helping to raise monies for Dorothy House Hospice Care. Winner of the race for ladies who came 5th was Rebecca Moore from Worthing & District Harriers who came in at 01:17:55. It was the taking part that counted and ABD Team managed to raise for Dorothy House Hospice Care £295.00 a fantastic amount! 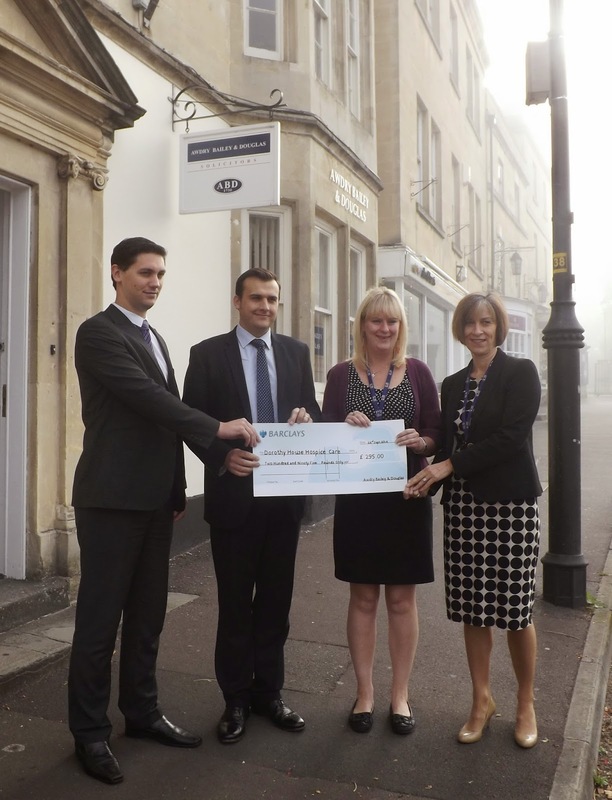 A presentation took place on Tuesday 23 September 2014 outside ABD Chippenham office whereby a “giant size” cheque was handed over to Emily Knight, Community Fundraiser and Phillippa Watson, Major Gifts Fundraiser for Dorothy House Hospice Care. The cheque was presented by both ABD Partner - Alexander David who is Head of Family Department, and Tom Paget, member of the ABD Commercial Department both based at ABD’s Chippenham Office. 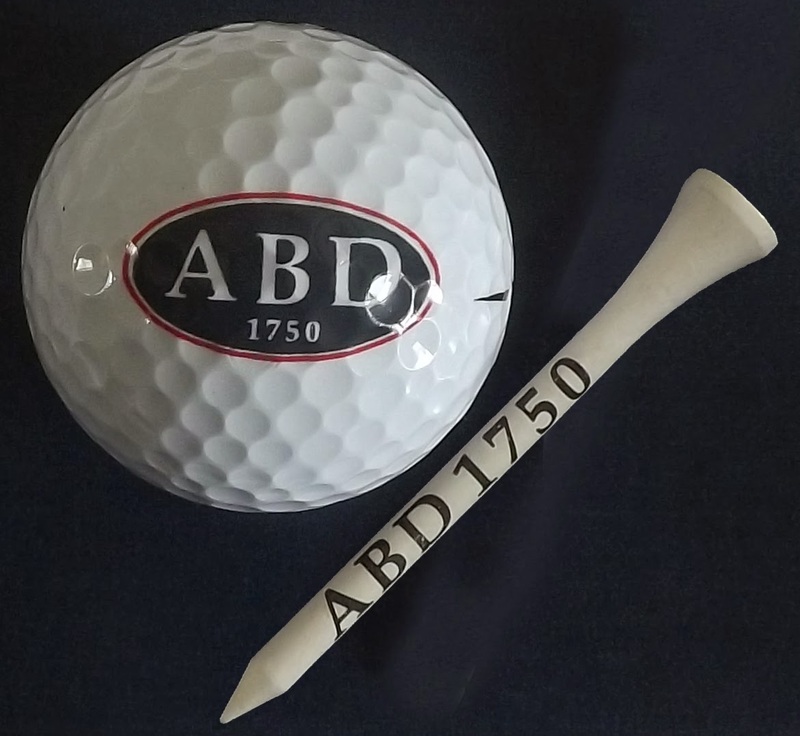 ABD GOLF EVENT DAY – ANOTHER ONE TO REMEMBER! It was coffee and bacon butties for starters followed by a quick speech by ABD partner Andrew Douglas and off they went. The format was easy! PGA Pro – Simon Shanks was on hand to give advice at the Pro Clinic Driving Range and there was putting practice on the green beforehand. The weather was fantastic. Perfect for a round of golf on the magnificent 18 hole course, starting off from the 10th tee in their four ball teams. NOT JUST A SIMPLE ROUND OF GOLF! Pre-drinks were then served in the Clubhouse Brasserie afterwards followed by a delicious 3 course dinner, speeches and prize-giving. The magnificent ABD Cup was won by Alistair Everett whilst former ABD Champions looked on. It was a late night and a TRULY memorable day. Taste Wiltshire! Discover your local pantry! Awdry Bailey & Douglas (ABD) was proud to support this local fun filled event which took place on Sunday 14 September 2014 in the village of Urchfont, near Devizes. As well as ABD there were other local supporters too. The event was a great success. There was street food and local produce to be purchased and live music to listen to. Local highly qualified chef and proprietor of The Bistro Restaurant and Cookery School - Peter Vaughan provided the audience with some great cookery tips and cookery demonstrations using local produce. This was followed by headline act Natalie Coleman - 2013 BBC MasterChef Champion who also demonstrated her “winning” cookery skills whilst talking the audience through her quick and easy recipes. Natalie has a new book coming out next year called “Winning Recipes for Every Day”. BBC News Wiltshire was also on hand to interview the stall holders, chefs and visitors about their day and the event which added to the excitement! Stalls with delicious local produce included homemade breads, mushrooms and fungi, cakes, homemade apple juice, beers, honey, rapeseed oil varieties and MORE! The event was organised by Redhone Community Trust who hope to run a similar event next year. Any profits made will go to Wiltshire Air Ambulance. More information about the event? Go to ABD Pinterest and take a snap shot look! CHARITY GOLF DAY EVENT RAISES £1,846! Awdry Bailey & Douglas was proud to support The Lions Club of Chippenham in a charity golf day event in aid of Orchid Cancer Charity which took place on 25 August 2014. ABD also sponsored “The Longest Drive for the Men” competition! The weather was awful! But it didn’t stop close to 70 hardy golfers playing! The overall profit raised at this great event was £1,846 which will go to St Bartholomew’s Hospital in order to help them in their research to treat and cure prostate and testicular cancer. Awdry Bailey & Douglas were proud to support this very worthwhile event now in its third year which took place on Sunday 3 August 2014 in aid of Greatwood and Wiltshire Air Ambulance on the fabulous Barbury Castle Estate. The novice’s non-handicap – a 2.5 mile race. The weather was sunny, no horses and runners enjoyed the day! The weather was lovely on the day of the run but the day before it was pouring with rain! Prizes were presented by Nigel Bunter of Barbury Estates. Monies raised in total were £3,000 which will be presented to Greatwood Children’s Charity and Wiltshire Air Ambulance with a small amount retained by Marlborough & District and Swindon Phoenix Rotary Clubs to support small local projects and charities.